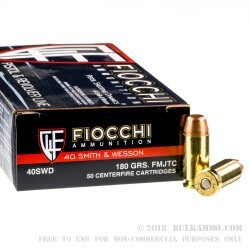 High quality 40 SW range ammunition that will cycle in most firearms, Fiocchi Ammuiniton is widely becoming known on the American marketplace as a trusted brand with excellent reliability and above average performance for the money. 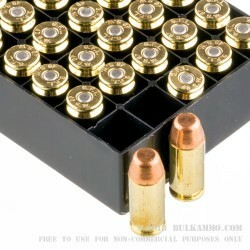 A clear winner on the pricing front, this ammunition punches above its weight class on many facets. The clean powders and primers offer a better experience for the money. Boxer primers and high quality powder produced in house by Fiocchi deliver excellent reliability in ignition. Highly polished brass retains its sheen after firing for easy cleanup prior to reloading. 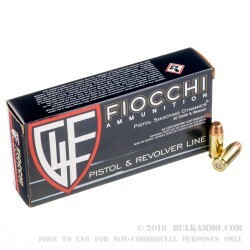 The brass is also produced in house by Fiocchi in Italy. The FMJ 180 grain full metal jacketed truncated copper clad projectile is a very reliable target bullet and has excellent accuracy. 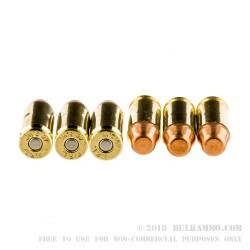 This round is a solid choice for a wide variety of shooting needs and the power that the 180 grain projectile packs, makes it very good for intermediate range steel target shooting. 1000 feet per second velocity and 399 ft. lbs. of energy offer great knock down power for such exercises. The price point is solidly in the value-line territory but the value exceeds the cost to the shooter.